MSD Ignition 31329 Custom Spark Plug Wire Set. Note: This set is for a Small Block Ford 255/302(5.0L)/351W with HEI Style Distributor Caps. Spark Plug Boot Style: Multi-Angle. Distributor Boot Style: 90 Degree HEI. Spark plug wires are one of the most important pieces of the ignition system. You can have the best ignition control and coil possible (and with MSD, you will), but if the plug wires aren't up to snuff, all the energy will just be wasted. Not only do plug wires need to carry extremely high voltages, but they have to do it in a harsh environment. Wires must be able to handle extreme heat, abrasion, and even getting whipped around from racing speeds. Also, the crimps and connections must be secure and live up to being pulled off in the pits during tune-up sessions. To meet and exceed these demands, MSD offers the 8.5mm Super Conductor perfomance and racing wire (red or black). The MSD 8.5mm Super Conductor is the ultimate performance wire! Its extremely low-resistance combined with the ability to suppress Electro Magnetic Interference is a combination that defies the common laws of physics. Less resistance means more energy is going to make it to the spark plug to ignite the air/fuel mixture. The Super Conductor uses a copper alloy conductor resulting in less than 50 ohms per foot of wire! This ensures that the most energy possible makes it to the spark plug. This combination is encased in a heavy duty sleeve that will withstand abrasion and high temperatures. Plus, they are engineered with strong crimps, high-temp sleeving and heavy-duty boots to deliver the performance enthusiasts and racers expect from MSD Ignition. Custom Spark Plug Wire Set. Custom Spark Plug Wire Set; Red Super Conductor 8.5mm; 8.5mm; Fits Ford Small Block Engines; HEI Boots. Coil Wire Length: 26.000 in. WARNING CA Proposition 65: Yes. Wire 1 Length: 24.000 in. Wire 2 Length: 23.000 in. Wire 3 Length: 37 in. Wire 4 Length: 31 in. Wire 5 Length: 25 in. Wire 6 Length: 37 in. Wire 7 Length: 28 in. Wire 8 Length: 34 in. Custom Fit For Make And Model Listed. Wires Are Pre-Cut To Exact Specifications. The MSD 8.5mm super conductor wire is the performance wire. Engineered from the inside out, the 8.5 offers everything you have ever wanted in a wire; incredibly low resistance without electronic interference. In a single 12 inch length of super conductor wire there is only 40 - 50 ohms of resistance. That is the lowest resistance of any helically wound wire. To accomplish this, we use a copper alloy conductor due to it's great voltage carrying capabilities. The low resistance results in less loss in spark energy so more reaches the spark plug. The conductor is wound extremely tight around a special center core. So tight in fact, that there is over 40 feet of conductor wrapped into a single foot of plug wire. This winding procedure, combined with a ferro-magnetic impregnated center core, produces an extremely effective electro magnetic interference (EMI) or choke. This choke, or suppression capability, keeps the EMI inside the wire where it cannot interfere with other electronics on your vehicle. The outer sleeve that surrounds the conductor assembly is just as impressive. A proprietary blend of silicone and synthetic material produce a sleeve that is highly resistant to high heat as well as abrasion and tears. Available in universal kits and bulk lengths. The team at MSD is no different as we strive to deliver the products you need to meet your performance goals. We continue to innovate and invent components and technology that deliver performance and reliability with products that are easy to use and install. Over the course of 40-plus years, MSD Performance has been driving the development of innovative components that helped shape the way our cars race and perform. From super speedways to road courses, land speed racing to top fuel dragsters, and of course your traditional hot rod, MSD has provided the components to fire nearly anything in motorsports. Early on, MSD focused squarely on ignition systems with revolutionary products like the multiple sparking CD ignition, timing and rev controls, billet aluminum distributors and the Pro-Mag, an incredible breakthrough in power and endurance. Today MSD is developing electronics for your entire powertrain. The Atomic EFI systems for the LS engine platform and throttle body are now complemented with a transmission controller. Our DynaForce Starters and Alternators ensure that your engine cranks over to fire up and the Alternators keep it charged. MSD is poised to deliver components that work and communicate together to provide performance and value. Starting from a small garage in the 50's to the beautiful new 6000sq ft showroom we have today, customer service has always been a top priority. We can only process Domestic credit cards. Which carrier is used depends on your location. We will choose the carrier that will deliver the quickest for your location. We can not and will not declare an item as a gift. We strive for accuracy, however, there could be discrepancies on the manufacturers end with listing applications. PLEASE MESSAGE US WITH ANY QUESTIONS OR CONCERNS ABOUT YEAR/MAKE/MODEL INFO IF YOU NEED! That said, we will assist in processing a claim. In either case, we will assist in the process. This listing is currently undergoing maintenance, we apologise for any inconvenience caused. 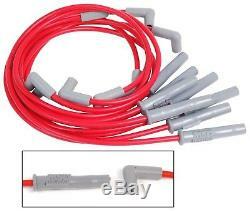 The item "MSD Ignition 31329 Spark Plug Wires 77-Up Ford 302/5.0L/351W HEI Cap Red" is in sale since Tuesday, July 29, 2014. This item is in the category "eBay Motors\Parts & Accessories\Car & Truck Parts\Ignition Systems\Ignition Wires". The seller is "espeedshop" and is located in Lindenhurst, New York. This item can be shipped worldwide.